Second Chance Toys- Great Giving Opp For Families! Second Chance Toys was started by then high school student, Sasha Lipton, who was tired of seeing beautiful plastic toys on the curb on garbage day. It upset her to think that these perfectly good toys were being thrown away when at the same time so many kids in the same and other neighborhoods couldn’t afford to have toys. She began collecting them with her mom, soon filling her basement with them. After she cleaned them, she donated them to local churches, food pantries, and children’s organizations. That’s how the idea was born. It was so simple in nature. So enormous and admirable in what it aimed to accomplish. Over the years, Sasha (now a college graduate) would share her story with people, and they would help. She was even able to get employees at Kohl’s interested in cleaning the toys as part of their employee volunteer efforts. 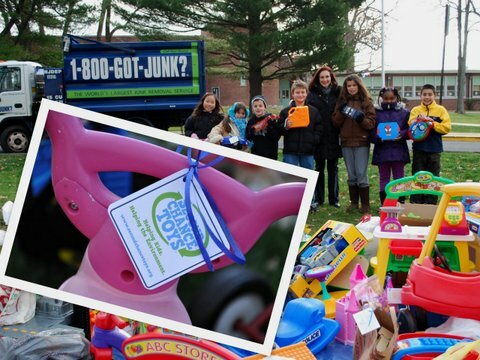 And her and her family were able to get 1-800-Got-Junk interested as well – they now transport all the toys. Wondering how you can help out? Second Chance Toys has been flooded with holiday toy requests. Do your part and start up a toy drive today at your local fire house, gym, school, library, or even your house of worship. The holidays are coming and it’s time to give these toys a second chance. This work by http://www.makingtimeformommy.com is licensed under a Creative Commons Attribution-Noncommercial-No Derivative Works 3.0 United States License.